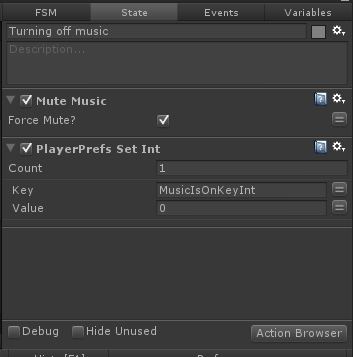 Hello, I want to show you how to create mute / unmute music system by using playmaker, ugui component named "toggle" and soundmanagerpro. So we want to create system that give us chance to mute and unmute music by using "Is On" property. That system suport (memory) gameprefs, so if you turn of music, close game, and run again, the music will be still turned off. 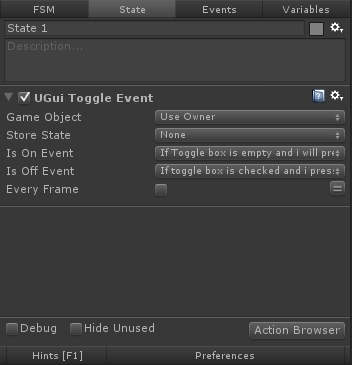 Ok, at first create uGui toggle component. Name it "Music is on". There are property "Is On" and this should be checked on. 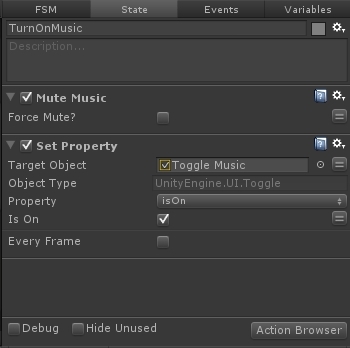 After that create empty game object and name it "MusicOnOffManager". 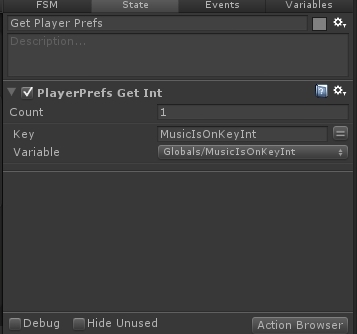 Create state, put there "PlayerPrefs Set Int" and as a Key use: "MusicIsOnKeyInt"
as a value us 1. And turn on scene. 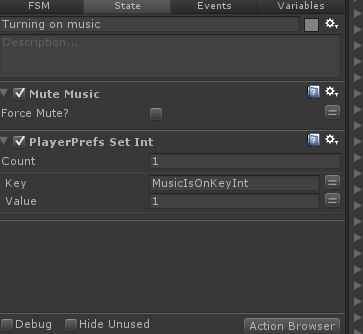 After that MusicIsOnKeyInt key will have "1" value at start - it will be save in project. Our project at first time will have music on so we need to make MusicIsOnKeyInt value = 1. Now you can delete thise state. This system will run only one time, when you turn on your game/apps. 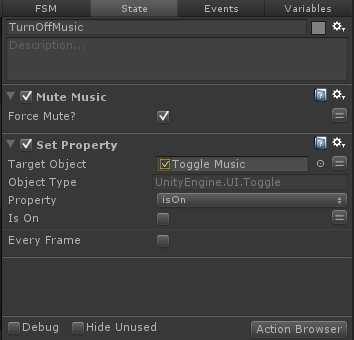 It will check gamprefs history to make your last decision to mute/unmute music and toggle on/off cmomponent. Wait for user interaction state is empty. Remember, "GlobalEnetKZ" is a Global event and global transition. 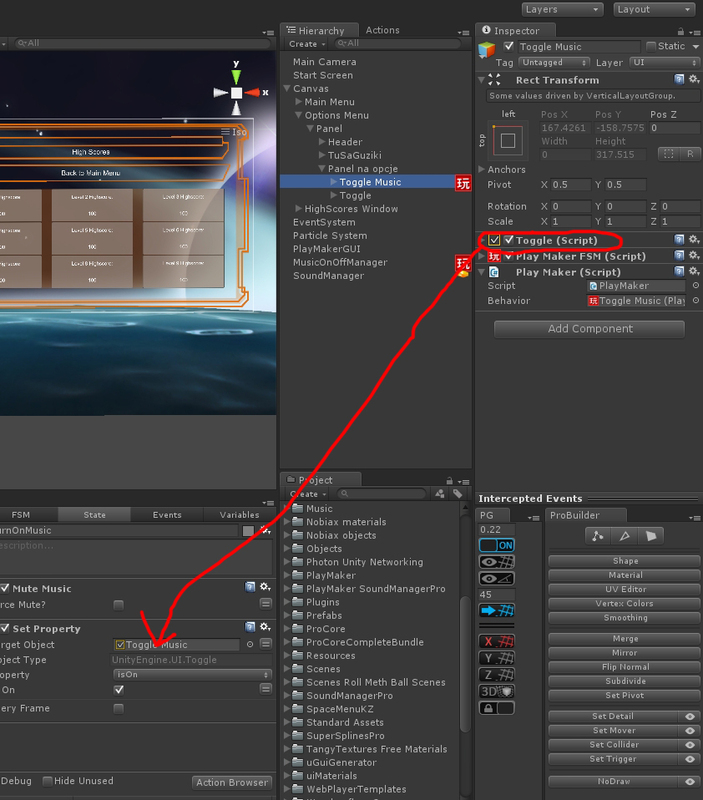 Ok, so if user press toggle component , that toggle component will run on "GlobalEventKZ" state. 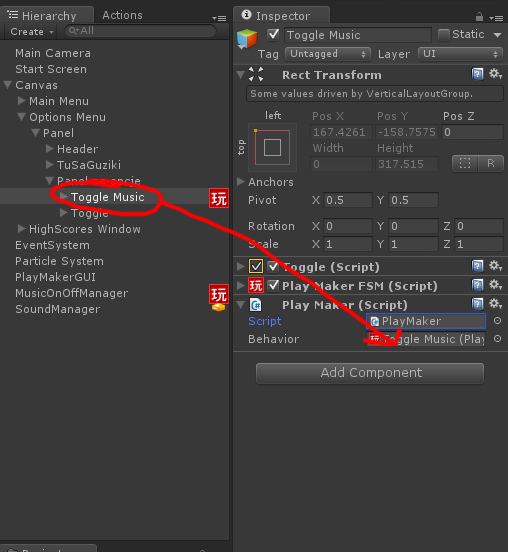 If Toggle box is empty and user will press it - scirpt will turn on music. 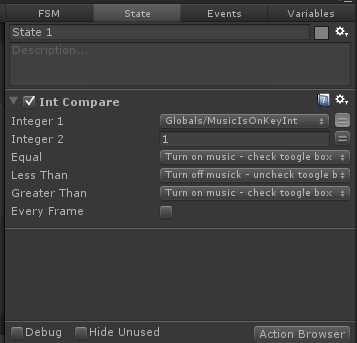 If toggle box is checked and user press it - script will turn of music . After that choose "Playmaker" (name of our maded script) and "wykonajto" function. Now, everytime user use toggle, GlobalEventKZ global event will be called.